Bad breath is a symptom of a poor oral health. But do you know that 10% of cases have the problem outside the mouth? Some serious health conditions are hiding behind this which you may ignore as minor issues. MedHouseCall is offering in-home healthcare service in Ontario, Canada and has alerted patients against the symptoms for life-threatening illnesses. Bad breath is such a condition that has its root in some serious ailments. Here are some health issues that have a bad breath symptom. Some severe diseases like pneumonia, tuberculosis, and bronchitis have the symptom of bad breath. It denotes the lung infection that causes the issues. Many health organizations use breath for detecting these health problems. Those who are suffering from lower respiratory tract diseases such as asthma or cystic fibrosis often have a bad breath problem. Our authorized doctors experience many a case where patients were not aware of these health issues until they were asked to go for a medical test. Menstruation can also be one of the reasons for bad breath. Women have the issue before or during their period because of having the lower saliva level. When you are under a medication, you can experience a smelly breath. Drugs sometimes make your salvia dry and that causes the bad breath problem. If you are taking medicines for Parkinson’s disease, asthma, and hypertension, you have a higher chance to experience the problem. The fish odor syndrome that is responsible for the body odor is a genetic issue. This disorder interrupts the choline breakdown that starts building up trimethylamine. The smell sometimes can be felt like rotten eggs or garbage. The home visit physicians warned patients against some easily avoided symptoms which are linked to the serious health complications. Doctors help them to take care of their health and never take a negligent attitude to their complication, no matter how small the problem is. Sometimes late stage liver failure has bad breath symptoms. The sweet, musty aroma is considered to be the early detection of this complication. Those who are on their keto diet can have the smelly breath problem. In this diet, your body burns fat for fuels that produce chemical called ketones. This is why your breath smells poorly. Fasting or skipping meals have a similar result. Diabetic patients are suffering from this problem and they have ketone breath because their body does not produce enough insulin. 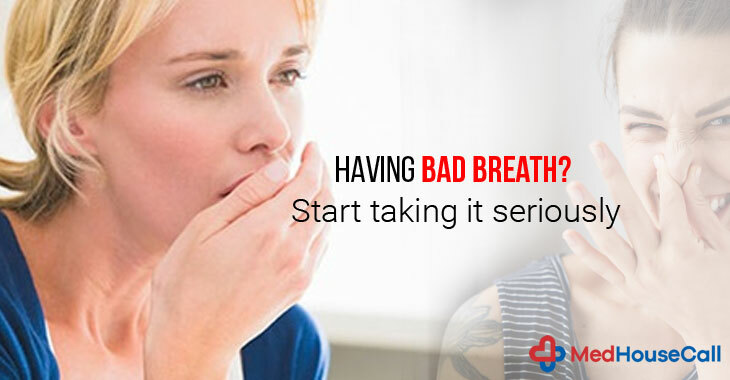 Bad breath is not an ignorable topic, and you have to consult a physician if you are having this problem. MedHouseCall offers in-home health care service to patients lived in Ontario, Canada. You can book our doctors’ appointment and they will visit your place for the medical treatment. Christmas brings smiles on everyone’s face. The lights and décor make the environment perfect for merrymaking. It is the party time and overeating is very common during this season. MedHouseCall experienced that most people suffer from depression after the party season gets over. Poor health and different complications also spike during this season. Our homecare physicians offer you some suggestions to measure the indulgence and take a healthy escape from plans. We will never tell you to sacrifice everything to stay healthy. Rather, you can eat anything and everything but in a portion. This limit helps you stick on your diet plan and enjoy the time in the best way. At MedHouseCall, the experienced doctors mention some easy practices so that you do not feel loaded while carrying out these plans. The recommended amount for alcohol is one drink per a day for women and two drinks for men. Make a plan for it and say yourself no when you tend to cross the limit. Sip sparkling water in between drinks to limit the alcohol intake. It is the best way to burn extra calories that you gained. Stay active during this festive season and take a healthy route for celebrating this Christmas. When it comes to workouts, it always brings with it a boring mode. Include your family member and enjoy your exercising with fun. When you stay hydrated, you get less confused between thirsts and hunger. It deters you from overeating and enough water intakes allow you to maintain a healthy lifestyle. Besides, water works as a filler. If you drink only 2 cups of water before a meal, it cuts down your hunger. The festive season is for tasting varieties of foods. You have to learn to say no when the food habit seems wrong to you. You must limit your sodium intake if you have hypertension issue. Don’t starve before a party. Enjoy a healthy meal at home before you are exposed to fatty and sugary options. A Holiday season sometimes seems stressful. Stresses cause the release of cortisol hormone that increases the craving for sugar. Do some yoga or meditation to feel relaxed. You must be aware of your calorie intake. A slice of a cake, a packet of chips, and a scoop of ice cream can make a big damage. Try to replace these choices with veggies and fruits. They contain low calories and are healthy for your health. The recent research showed that making others happy makes you feel good and peaceful. This Christmas, try to spread happiness and joy. Spend time with the homeless and do something for them. You will enjoy a happier Christmas. MedHouseCall is one of the trusted in-home healthcare units in Ontario, Canada. Experienced doctors always help patients with valuable suggestions and the needed treatment procedures. 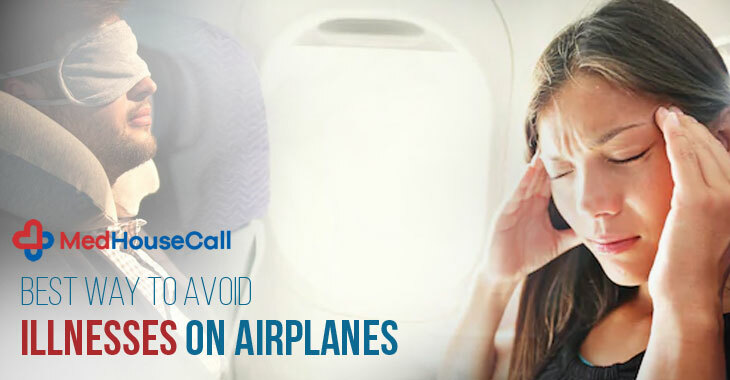 The on-call doctor demand service helps you book a doctor’s appointment to visit your place for the treatment. 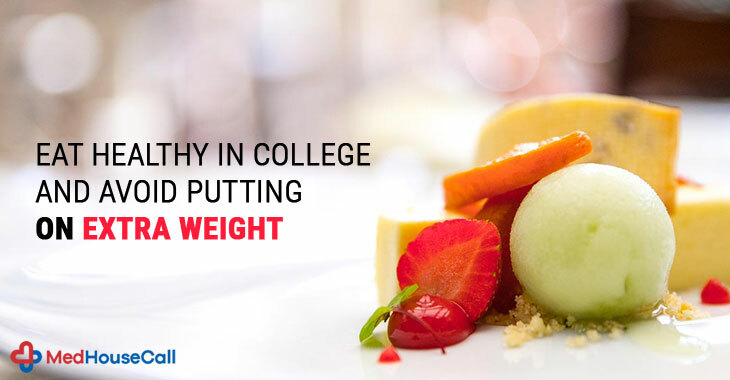 MedHouseCall has often noticed that college students are having a conscious thought about their weight. But, an unhealthy lifestyle in a college puts them worried and this is a reason for so many psychological complications, such inferiority complex, anxiety, and other problems. We are here to give some easy tips that you can maintain to avoid putting on extra weight. MedHouseCall is an in-home physician care in Ontario, Canada and works for improving the healthcare system. We bring medical assistance to your home so that you can get a professional treatment from a licensed doctor within your home comfort. When students get into a college, they cherish a high ambition and thoughts and at the same time, they enjoy the freedom from the restriction of their school lives. They are more tend to adopt an unhealthy diet because the looks of the foods available on your college premises are really hard to ignore. But, you can easily get rid of these temptations. Follow these tips below. Four types of nutrients are important for your health – carbs, fats, proteins, and fibers. These nutrients make you feel full and reduce the craving for unhealthy snacks. The variety of foods brings to you different cuisines that you have not tested before. It makes your meal even more interesting. 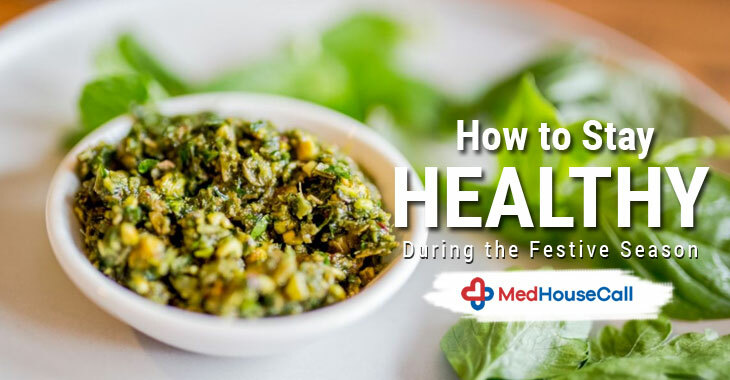 MedHouseCall always suggests you eat healthy because it helps you avoid so many complications easily. A boring diet always tends to divert your attention to harmful choices. So, it is really important to love what you eat. Healthy eating does not mean you have to give up all flavors. You can follow an appropriate serving size if you want to maintain a healthy diet option. If you get bored, you can have a cheat day breaking your all routines. Snacks and foods are very tempting to eat. So, you can take a cheat day, but don’t make it a habit. Always eat moderately to avoid the overweight problem. Drink water enough. Though you have some flavorful options such as fruit juices to control the fluid intake of your body, water does not have any replacement. Skipping meal will result disastrously for your health. Maintain your breakfast, lunch, and dinner time. A regular exercising is important for your healthy lifestyle. At MedHouseCall, we always guide patients to check their healthy living to cut down the risks of falling sick. Whenever you are in need of a doctor, contact us. Our experienced home visit physicians will treat your problem and help you get well soon. 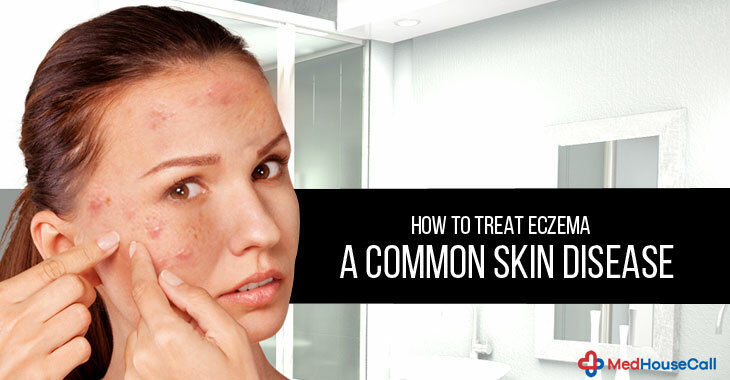 Eczema is a medical condition where the patches of skin turn red, itchy, and inflamed. The exact reasons for this skin disease are not known yet, but dermatologists come up with some facts which trigger eczema. It is a very common skin condition and many people are suffering from this issue. Sometimes, it causes blisters on the skin and the irritation is truly unbearable. A complete take care of your skin may help you prevent the problem. Get doctor on call in Ontario, Canada and ask a doctor to visit your home for the treatment as per your convenience. Though it is not a life-threatening disease, negligence may make the situation worse and out of control. The most common type of eczema is called the A topic Eczema. A topic signifies the group of diseases that have an inherited tendency to cause some other allergic conditions such as Asthma and hey fevers. Infants are at the risk of this skin irritation and 10 to 20% of infants are having this problem in the U.S. The symptom is always itchy and causes rashes. The most affected areas are knees, wrists, and hands. It has a direct connection to the body’s immune systems and is mainly caused by its overactive response. There are some situations that trigger the problem more. If you are feeling too hot or too cold, you may have the chances to develop this problem. When your skin gets contact to the rough materials or the animal dander, it also causes the problem. The use of some household products like detergent and soaps also make your skin dry and irritant. Symptoms develop according to the age, but itchy skin patches are common to all. Smoke and pollution can also trigger this skin problem. Our doctors offer in-home consultations for you. If you take the right care of your skin, you can avoid the problem. Authorized and licensed doctors come up with the best approaches that help you heal eczema at home if the situation is not too serious. If you experience a prolong symptom, our Quality Health Care Home service will help you. Our doctors suggest some solutions that you can maintain at your home. MedHouseCall is a trusted name in the on-call doctor service in Ontario, Canada. This health care center is joining the drive to improve the medical industry by visiting patient’s place for the treatment. They offer an individual attention and consider hygiene issues to offer better treatment to them. Sleep is an important activity. If you have a sleeping problem, your health will get affected by many complications. There are countless problems human being is suffering from due to the lack of sleep. Late night studies, professional necessities, and social gathering are some of the causes that obstruct your good night sleep. Doctors at MedHouseCall often find that people suffer from severe health issues like obesity, heart disease, or high blood sugar level because of not having a quality sleep. 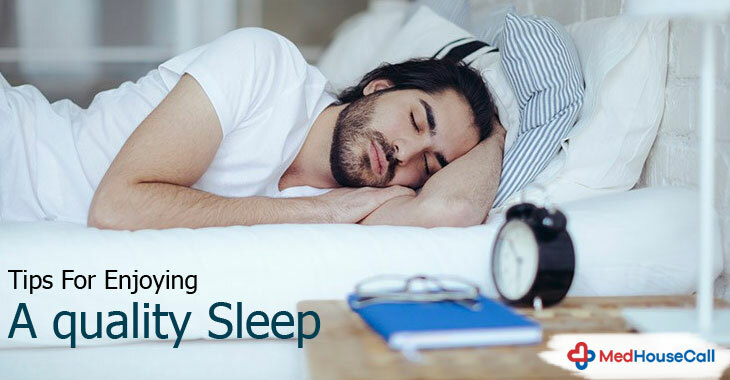 Here, we come up with a few details that make you understand the importance of sleeping and help you enjoy a sound sleep. Not enough of sleep is the reason for poor health and its effects will be visible on both professional and personal life. You feel weak in your office that makes your performance low. Besides, you will also experience emotional difficulties, daytime sleepiness, mood swing, anxiety, and depression. So, you can guess why sleep is important. MedHouseCall has researched sleep deprivation because we are having many requests to deal with anxiety issues. Sleep is one of the primary options. We offer in-home healthcare facility so that patients can book their appointment as per their convenient. Our home visit physicians conduct treatment at patients’ home. We addressed some common causes of health complications and we found that most of the cases have sleep deprivation the main cause. If you don’t enjoy a proper sleep, you will face problems which are mentioned below. If you have a sound sleep, your immunity will also get strong. But, lack of sleeping will make your immunity system poor and you will get affected by cold and cough easily. Obesity puts many health care units across the world in worry. It has proven that sleep deprivation has a direct connection with weight gain and the obesity issue. It also affects your metabolism and eating habit. Do you know sleep deprivation is the cause of diabetes? Inadequate sleep releases insulin and stores fat. It also increases the chance of type 2 diabetes. Sleep deprivation for a prolonged time can be the reason for anxiety and depression. You can experience a change in your mood. Low self-esteem is sometimes felt in those who ignore a quality sleep. The doctors at MedHouseCall are worried because sound sleep is really required for human health, which people are ignoring knowingly and unknowingly. We help you with some tips for maintaining a good night sleep. Maintain a sleeping time: Maintain a sleeping time regularly. A fixed bedtime routine will help you fall asleep easily. Don’t eat heavy meals 2 to 3 hours before your sleeping time. Maintain some physical exercises regularly. Bright lights or noises obstruct your sleep. So, switch on a dim light. MedHouseCall is gradually spreading their units across Canada. When you need in-home health care facility, inform MedHouseCall. Our licensed doctors will treat your ailments at your home and take care of your need carefully. They check your problem attentively and prescribe medical assistance as per your health. The chilling breeze of December started blowing with a message that Santa will come soon. Everyone is busy planning big with parties, events, and more. You also get carried away by the sweet note of Christmas and start avoiding your healthy routine. But, overweight or unnecessary weight gain puts you in a big trouble as weight is considered to be a source of different diseases. 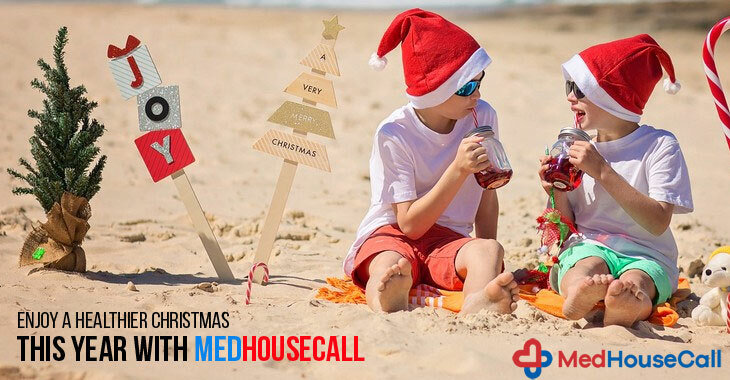 We at MedHouseCall wish you Merry Christmas in advance with some healthy tips that check your weight. We are offering an in-home consultation service in Ontario, Canada and make the healthcare system easy to reach for people. With the help of our service, you can book a doctor’s appointment who will visit you. The treatments will be performed at the comfort of your home. Our licensed doctors are experienced and conduct medical treatment as the situation needs. We will be available always, even in the odd hours at night. Here, we come up with a few tips that will help you to avoid the extra pounds in this festive season. You need to keep maintaining your regular routine to stay active and healthy. If you drink lemon water in an empty stomach or drink 3 liters water a day, you must maintain it even in the festive time also. The event planners these days take a different note and keep greens on their dishes. So whenever you get a chance to eat greens, never say no. green smoothies are very popular and they are good for your health as well. If you starve and go hungry to an event, your hunger will be suppressed by chips, snacks, and drinks. These are not good for you. Give your health enough protein before enjoying all these foods. Drink enough water and hydrate yourself. It makes your skin look good and keeps you healthy as well. It is okay to excuse your routine for a day but don’t make the festive season an excuse always. Measure your meal so that it does not make you feel bloated. If you want to be the best version of you, a healthy diet is a stepping stone. Start your day with some activity that enhances your energy. During the festive days, you will get busy in a preparation and don’t find time for you. Everyone needs to spare 20 minutes every day for exercise. So, these tips will help you enjoy Christmas without letting you put on extra weight. We understand that your plans and events are to be going on for a month and this is why you need to make a healthy habit for you. We at MedHouseCall are at your service anytime. If you need any consultation, please call us. We are happy to bring a doctor on call service in Ontario, Canada.